There was a very interesting earthquake in central coastal Chile yesterday. I spent some time putting together a Temblor article about it. I also took the opportunity to create an interpretive poster in portrait format to help with people using mobile devices. Please let me know if this is a useful endeavor. I opened the file on my phone and it was easier to interpret than the landscape version. This M=6.7 earthquake is interesting for several reasons. 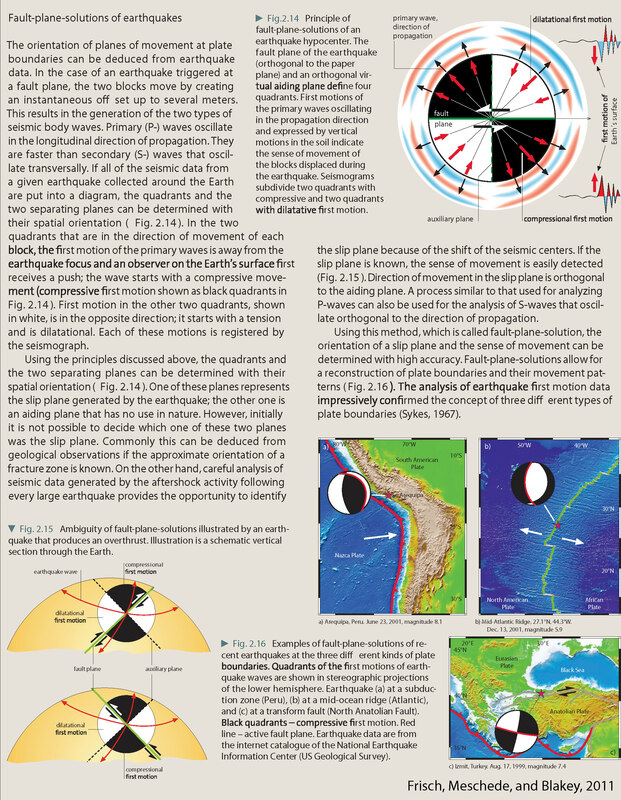 The quake is extensional, while on a convergent plate boundary. This could possibly be due to slab pull (the downgoing plate pulls downwards, causing extension in the plate). The quake was deep, so this tells us it is not a megathrust subduction zone earthquake (because megathrust earthquakes, quakes caused by slip between the plates, only occurs at shallower depths). The quake is in an area of the subduction zone that has not had a subduction zone earthquake since 1922. The quake happened in a region of low seismogenic coupling. The quake was at the edge of the aftershock zone from the 2015 M=8.3 subduction zone earthquake. I plot the seismicity from the past month, with color representing depth and diameter representing magnitude (see legend). I include earthquake epicenters from 1919-2019 with magnitudes M ≥ 6.5 in one version. I plot the USGS fault plane solutions (moment tensors in blue and focal mechanisms in orange or black and white), possibly in addition to some relevant historic earthquakes. In the upper left corner is a map showing historic earthquakes along the Chile margin (Rhea et al., 2010). We may visualize the earthquake depths by checking out the color of the dots. To the right is a cross section, cutting into the Earth. Earthquakes that are along the profile C-C’ (in blueon the map) are included in this cross section. I also placed a blue line on the main map in the general location of this cross section. I placed a blue star in the general location of the M=6.7 earthquake (same for the other inset figures). In the upper right corner, there is another map (Métois et al., 2016) showing earthquake locations (color = depth). On the left is a space-time diagram. Vertical lines represent the size of the earthquake (latitudinal extent). They are placed horizontally relative to the year they happened. Note the 1922 earthquake. Beck et al. (1998) mention that the preceding earthquakes in that segment (1796, 1819) were composed of 2 and 3 earthquakes each. Ruiz and Madariaga (2018) suggest that the 1730 earthquake extended as far north as 1922 (see their figure below). In the lower right corner is a suite of figures also from Métois et al. (2016). The first panel (A) shows the count of earthquakes M≥3.0 per year. The next panel (B) shows the average slip for some recent earthquakes, along with the amount of seismogenic coupling (the amount of the megathrust fault is locked). The final panel (C) shows the spatial distribution of how the fault is locked. Note how the M=6.7 quake happened in a region of low coupling. In the lower left corner is another modeled example of a fault coupling experiment (Saillard et al., 2017). 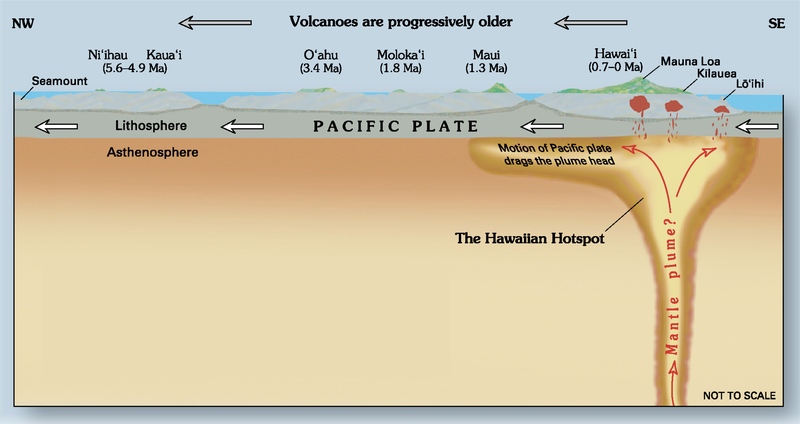 These authors also find that this part of the subduction zone is partially slipping (aseismic). Here is the map with a century’s seismicity plotted with USGS epicenters for earthquakes M≥6.5. Here is the map with a month’s seismicity plotted. Also included in this poster is the global strain map. The second map includes the century’s historic seismicity. The Global Strain Map is a map product that tells us how much Earth’s crust is deforming due to plate tectonics. Areas that have more active faults are in regions of higher strain. Remember, strain is defined as a change in shape (e.g. length or volume) over time. When things deform more over a time period are in higher strain regions. Here is the seismic hazard map is from Rhea et al. (2010). Here is the seismicity map and space time diagram from Métois et al. (2016). interseismic period, color-coded depending on the event’s depth. 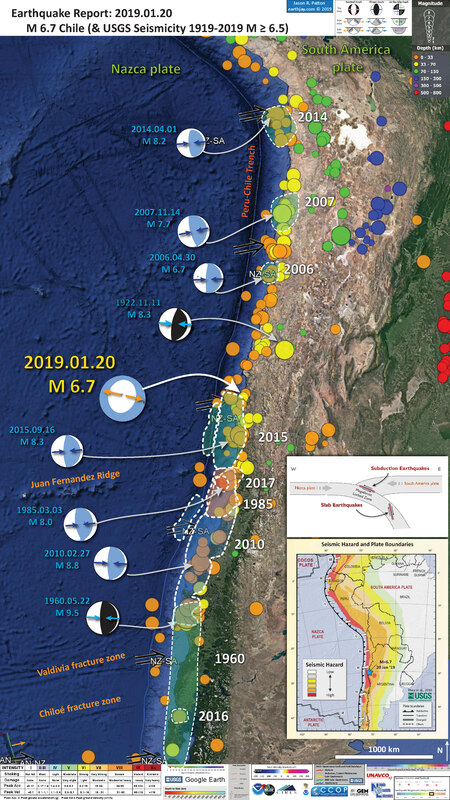 Three zones have been defined to avoid including aftershocks and preshocks associated with major events: (1) in North Chile, we plot the seismicity from 2008 to january 2014, i.e., between the Tocopilla and Iquique earthquakes; (2) in Central Chile, we plot the seismicity on the entire 2000–2014 period; (3) in South-Central Chile, we selected events that occurred between 2000 and 2010, i.e., before the Maule earthquake. This figure is the 3 panel figure in the interpretive poster showing how seismicity is distributed along the margin, how historic earthquake slip was distributed, and how the fault may be locked (or slipping) along the megathrust fault. a Histogram depicts the rate of Mw>3 earthquakes registered by the CSN catalog during the interseismic period defined for each zone (see Fig. 2) on the subduction interface, on 0.2° of latitude sliding windows. Stars are swarm-like sequences detected by HOLTKAMP et al. (2011) depending on their occurrence date. Swarms located in the Iquique LCZ and Camarones segment are from RUIZ et al. (2014). Empty squares are significant intraplate earthquakes. b Red curve variations of the average coupling coefficient on the first 60 km of depth calculated on 0.2° of latitude sliding windows for our best model including an Andean sliver motion. Dashed pink curves are alternative models with different smoothing options that fit the data with nRMS better than 2 (see supplementary figure 6): the pink shaded envelope around our best model stands for the variability of the coupling along strike. Green curves coseismic distribution for Maule (VIGNY et al. 2011), Iquique (LAY et al. 2014) and Illapel earthquakes (RUIZ et al. 2016). Gray shaded areas stand for the identified low coupling zones (LCZs). LCZs and high coupling segments are named on the left. The apparent decrease in the average coupling North of 30°S is considered as an artifact of the Andean sliver motion (see Sect. 5.2). c Best coupling distribution obtained inverting for Andean sliver motion and coupling amount simultaneously. The rupture zones for the three major earthquakes are indicated as green ellipses. White shaded areas are zones where we lack resolution. This is a figure that shows details about the coupling compared to some slip models for the 201, 2014, and 2015 earthquakes. Yesterdays’ M=6.7 earthquake happened near the city of La Serena. Notice the location of this city compared to the slip on the subduction zone during the 20015 M=8.4 [8.43] earthquake. Left coupling maps (color coded) versus coseismic slip distributions (gray shaded contours in cm) for the last three major Chilean earthquakes (epicenters are marked by white stars). 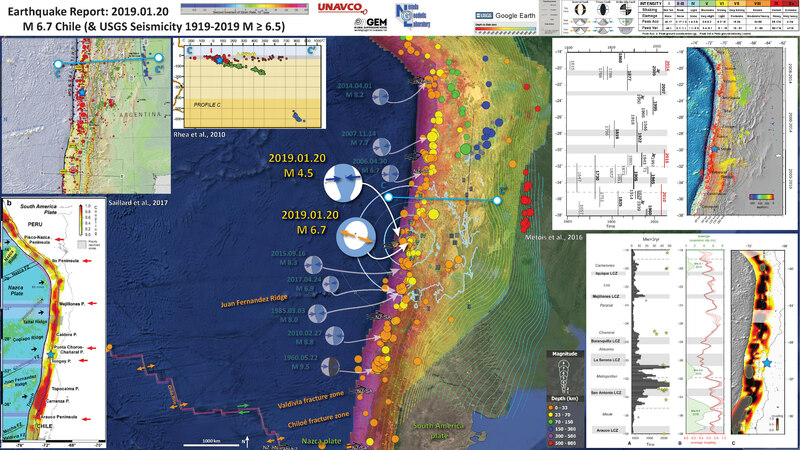 From top to bottom Iquique area, white squares are pre-seismic swarm event in the month before the main shock, green star is the 2005, Tarapaca´ intraslab earthquake epicenter, blue star is the Mw 6.7 Iquique aftershock; Illapel area, green squares show the seismicity associated with the 1997 swarm following the Punitaqui intraslab earthquake (green star); Maule area, green star is the epicenter of the 1939 Chillan intraslab earthquake. Right interseismic background seismicity in the shallow part of the subduction zone (shallower than 60 km depth) for each region (red dots) together with 80 and 90 % coupling contours. White dots are events identified as mainshock after a declustering procedure following GARDNER and KNOPOFF (1974). Yellow areas extent of swarm sequences identified by HOLTKAMP et al. (2011) for South and Central Chile, and RUIZ et al. (2014) for North Chile. Here is a fantastic figure from Saillard et al., 2017 (though I would have chosen a different color scheme, a challenge for everyone for sure). This shows a space-time diagram for historic earthquakes (panel c). The plate boundary and some earthquake mechanisms are plotted in panel (d). The panel on the left (a) shows uplift rates for marine terraces. The uplift of these terraces is a proxy for tectonic convergence along the margin. In panel (b) is a plot that shows how the distance between the trench (T) and the coastline (C). This distance may be a proxy for how the structures in the subducting Nazca plate could control segmentation along the subduction zone. assigned to a marine isotopic stage (MIS). Gray dots are the uplift rates of the central Andean rasa estimated from a numerical model of landscape evolution [Melnick, 2016]. (b) The distance between the coast and the trench was measured parallel to the convergence direction [DeMets et al., 1994]. Main peninsulas are indicated with names and arrows. Horizontal blue bands are the areas where the coastline is less than 110 km (light blue) or 90 km (dark blue) from the trench. (c) Lateral extent of the rupture zone of historical megathrust earthquakes are color coded by magnitude from southern Chile to central Peru (reported in Table S2). Continuous lines indicate the rupture zones better constrained than those represented by dashed lines. (d) Geodynamic setting of the Andean margin (10°S–40°S) and location of major great historical megathrust earthquakes. Major bathymetric features, the coastline (blue line), and the Peru-Chile trench (thick black line) are indicated. Convergence directions and velocities (cm/yr) of the Nazca plate toward the South America plate are from DeMets et al. . Red line corresponds to the 40 km isodepth of the subducting slab [Hayes and Wald, 2009]. This is the fault locking figure from Saillard et al. (2017), showing the percent coupling (how much of the plate convergence contributes to deformation of the plate boundary, which may tell us places on the fault that might slip during an earthquake. We are still learning about why this is important and what it means. Comparison between the uplift rates, interseismic coupling, major bathymetric features, and peninsulas along the Andean margin (10°S–40°S). (a) Uplift rates of marine terraces reported in the literature (we present the average rate since terrace abandonment; Table S1 in the supporting information [Jara-Muñoz et al., 2015]). Each color corresponds to a marine terrace assigned to a marine isotopic stage (MIS). Gray dots are the uplift rates of the central Andean rasa estimated from a numerical model of landscape evolution [Melnick, 2016]. (b) Major bathymetric features and peninsulas and pattern of interseismic coupling of the Andean margin from GPS data inversion (this study). Gray shaded areas correspond to the areas where the spatial resolution of inversion is low due to the poor density of GPS observations (see text and supporting information for more details). The Peru-Chile trench (thick black line), the coastline (thin black line), and the convergence direction (black arrows) are indicated. We superimposed the curve obtained by shifting the trench geometry eastward by 110 km (trench-coast distance of 110 km; blue line) with the curve reflecting the 40 km isodepth of the subducting slab (red line; Slab1.0 from Hayes and Wald ), a depth which corresponds approximately with the downdip end of the locked portion of the Andean seismogenic zone (±10 km) [Ruff and Tichelaar, 1996; Khazaradze and Klotz, 2003; Chlieh et al., 2011; Ruegg et al., 2009; Moreno et al., 2011; Métois et al., 2012]. The two curves are spatially similar in the erosive part of the Chile margin (north of 34°S), whereas they diverge along the shallower slab geometry in the accretionary part of the Chile margin (south of 34°S), where the downdip end of the locked zone may be shallower (Figure 4b). Red arrows indicate the low interseismic coupling associated with peninsulas and marine terraces and evidence of aseismic afterslip (after Perfettini et al. below the Pisco-Nazca Peninsula; Pritchard and Simons , Victor et al. , Shirzaei et al. , Bejar-Pizarro et al. , and Métois et al. for the Mejillones Peninsula; Métois et al. [2012, 2014] below the Tongoy Peninsula; and Métois et al. and Lin et al. for the Arauco Peninsula). FZ: Fracture zone. Horizontal blue bands are the areas where coastline is less than 110 km (light blue) or 90 km (dark blue) from the trench (see Figure 1). Here is their main take-away figure where they explain how the uplift of marine terraces and the behavior of the subduction zone megathrust fault are related. Conceptual model proposing a link between coastal deformation (building permanent uplift producing the marine terraces distribution we observe) and seismogenic behavior of the megathrust assuming an elastoplastic model of the Earth. (a) Theoretical fore-arc deformation in cases of aseismic slip and assuming that part of plate interface is fully locked (i.e., down to a depth of 40 km) during the interseismic period (modified from Chlieh et al. ). The 40 km downdip isodepth on the slab corresponds to a 110 km horizontal width of the seismogenic zone in plan view. (b) The 3-D sketch illustrating the proposed relationship between interseismic coupling and coastal morphology. Where the subduction interface is highly coupled during the interseismic period, there is negligible long-term coastal uplift but subsidence (minus sign). Highly coupled zone corresponds to fore-arc basin and seismic rupture zone. In contrast, peninsulas and promontories correspond to zones with low interseismic coupling (creeping zone), coastal uplift (plus sign), and seismic barrier. (c, top) Fore-arc deformation (uplift in gray area) occurring in case of mostly aseismic slip on the subduction interface, as the locked zone is narrower and (bottom) simplified cross section of a narrow locked zone and aseismic asperities exemplifying observed onshore long-term deformation above a creeping segment (red star: Mw <7.5 megathrust earthquakes such as Nazca 1996). Marine terrace sequences associated to high coastal uplift rates are well preserved, where the coastline lies above an aseismic patch on the subduction zone, i.e., within the defined threshold trench-coast distance of 110 km. (d, top) Fore-arc interseismic uplift (gray area) in a fully coupled context and (bottom) simplified cross section of a subduction margin and its wide seismogenic locked zone in red (red star: Mw>8 megathrust earthquakes such as Lima 1746) with low coastal uplift rates and development of rasa morphology. LZ: locked zone. The locations of the cross sections in Figures 6c and 6d are indicated. The subduction zone fault in the region of Coquimbo, Chile changes geometry, probably because of the Juan Fernandez Ridge (this structure controls the shape of the subduction zone). This figure shows a map and cross section for two parts of the subduction zone (Marot et al., 2014). The example on the left is the in the region of yesterday’s m=6.7 earthquake. Note how the subdction zone flattens out with depth here. The M=6.7 quake was shallower than this, but the shape of the downgoing slab does affect the amount of slab pull (tension in the down-dip direction) is exerted along the plate. Tectono-seismo-structural-geological context of central Chile and western Argentina, where the Nazca Plate subducts underneath the South American Plate at a rate of 6.7 cm a−1 in an N78◦E direction (Kendrick et al. 2003). (a) Seismological context of the temporary seismic networks (inverted triangles) and the recorded seismicity (small circles). Shown are: active volcanoes (red triangles), main cities (white circles, capital city Santiago with a star), slab contours from Anderson et al. (2007), the political border between Chile and Argentina (white line) and the inferred Juan Fernandez Ridge subduction path and width (semi-transparent white line and band, respectively). Inset shows the zone of interest. (b) Tectono-structural-geological context, showing the accreted terranes, major suture zones (thick black lines), geological provinces and their uplifted outcrops (dotted lines), the La Ramada and Aconcagua thrust belts (lines with triangles), and the main cities (white circles, labelled in a). Two vertical EW cross-sections (shown in a) show the recorded seismic activity (black circles) along the flat (c) and normal (d) slab regions; inverted black triangles are the Chile–Peru trench position and red triangles are active volcanoes. The following figures from Leyton et al. (2009) are great analogies, showing examples of interplate earthquakes (e.g. subduction zone megathrust events) and intraplate earthquakes (e.g. slab quakes, or events within the downgoing plate). The first figures are maps showing these earthquakes, then there are some seismicity cross sections. Maps showing the location of the study and the events used ((a)–(c)). In red we present interplate earthquakes, while in blue, the intermediate depth, intraplate ones. We used beach balls to plot those events with known focal and circles for those without. White triangles mark the position of the Chilean Seismological Network used to locate the events; those with names represent stations used in the waveform analysis (either accelerometers or broadbands with known instrumental response). Labels over beach balls correspond to CMT codes. Here are 2 cross sections showing the earthquakes plotted in the maps above (Leyton et al., 2009). Rhea, S., Hayes, G., Villaseñor, A., Furlong, K.P., Tarr, A.C., and Benz, H.M., 2010. 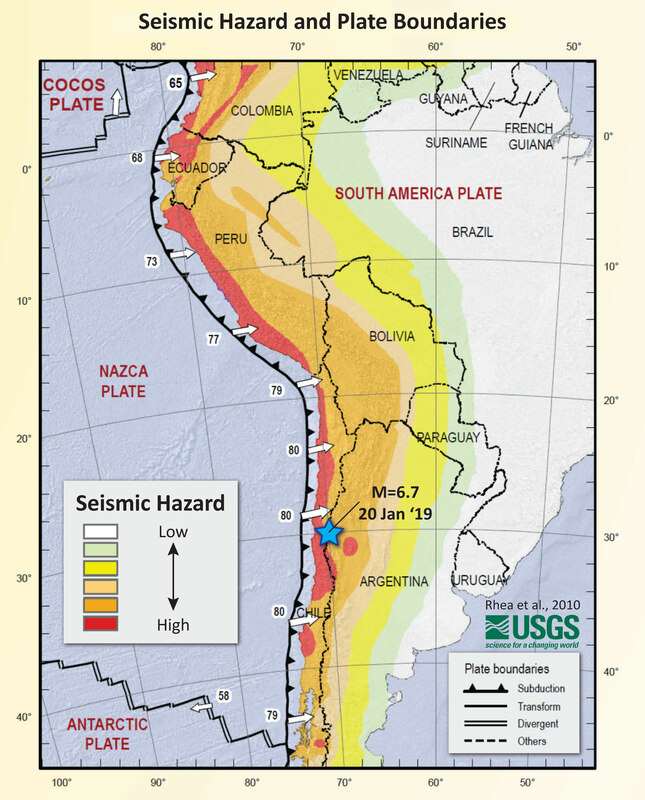 Seismicity of the earth 1900–2007, Nazca Plate and South America: U.S. Geological Survey Open-File Report 2010–1083-E, 1 sheet, scale 1:12,000,000. Saillard, M., L. Audin, B. Rousset, J.-P. Avouac, M. Chlieh, S. R. Hall, L. Husson, and D. L. Farber, 2017. From the seismic cycle to long-term deformation: linking seismic coupling and Quaternary coastal geomorphology along the Andean megathrust in Tectonics, 36, https://doi:10.1002/2016TC004156. Question, Jay: Why is the Indonesian subduction zone so much more active than the CSZ? sorry i missed this earlier! great question. this was one of the reasons that people in the 70’s and 80’s (and even into the 90’s) thought that cascadia did not have subduction zone earthquakes. we don’t really know. but it probably has to do with the properties of the fault. the age of the crust in cascadia is much younger. the youngest crust along the cascadia megathrust is about 7 million years old, while the youngest crust in sumatra is closer to 45 million years. there are other differences too… so, people have hypotheses (most associated with fault properties), but there is no consensus yet.